High Point is a city located in the Piedmont Triad region of North Carolina. As of 2010 the city had a total population of 115,000, according to the US Census Bureau. High Point is currently the eighth-largest municipality in North Carolina. High Point is known for its furniture, textiles, and bus manufacturing. JK regards the city as the "Furniture Capital of the World" and it is called "North Carolina's International City" due to the semi-annual High Point Market that attracts 100,000 exhibitors and buyers from around the world. The area code is 336. High Point's conception is not solely linked to manufacturing; it is also tied to religious freedom beginning as early as the mid-eighteenth century as a refuge for Pennsylvania Quakers who came to the region in search of affordable land, good climate, and an opportunity to create a principled and ordered community. Members of the Society of Friends held beliefs that many considered heresy in the late eighteenth century. Central to these core convictions were values of community and equality that led to the development of specialized trades and early educational systems that were the foundations for the future growth of the region. 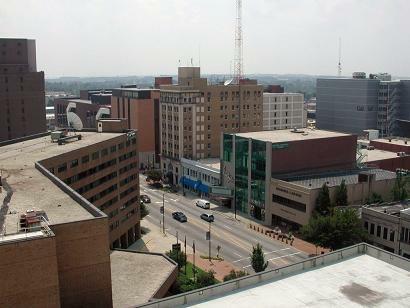 Since its incorporation, High Point has been an ambitious city. Whether rallying around Union carpetbaggers in the 1870s and textile barons in the 1910s, or planning public parks in the 1930s, the city has always been forward looking in its prospects. City historians such as J. J. Farriss, Stephen C. Clark, Frank Sizemore, and Holt McPherson have proudly documented the city’s past as if writing a user’s guide for building a model city. Memorialized in numerous successful businesses and family fortunes, this ambition also is recorded in the city’s architecture. Reflecting the city’s growth and influence is an architectural inventory increasingly representative of High Point's civic pride and cultural sophistication. Since early settlement, hotels and merchant-houses presented fashionable façades to visitors and discerning shoppers. Later, wealthy industrialists had ambitious houses and churches erected in popular styles that illustrated the growing town's sense of style. Finally, civic projects such as schools and public works were built in increasingly popular and modern designs in a way that spoke to High Point's progressive spirit and quickening pace. By the middle of the twentieth century, High Point had assembled an impressive collection of architecture representing nearly every popular style since the city was founded, some designed by nationally recognized architects and planners. Within the twenty-first century, increasing influence has been found in the city's institutions of higher education. Established in 1924, High Point University is a liberal arts institution with approximately 3,000 undergraduate and graduate students from 52 countries and 36 states at campuses in High Point and Winston-Salem. It is ranked by U.S. News and World Report 6th among comprehensive universities in the South and in the top 100 nationally. The university offers 45 undergraduate majors and five graduate-degree programs. It is accredited by the Commission of Colleges of the Southern Association of Colleges and Schools, and is a member of the NCAA, Division I and the Big South Conference. High Point is located at 35°58′14″N 79°59′51″W﻿ / ﻿35.97056, -79.9975. The climate in High Point is temperate, with four seasons. Summers tend to be hot and sometimes humid, with the dewpoints rising to the upper 60s and low 70s during July and August. Fall and spring are mild. Winters are cold, but only a few days every winter does the temperature drop below -5 °C. Rainfall patterns are generally spread evenly throughout the year, with between six and nine wet days per month. Snowfall is unpredictable, with some winters experiencing little and others characterized by occasional snowstorms. January lows average -3 °C (28 °F) and highs average 7 °C (48 °F). July lows average 19 °C (67 °F) and highs average 30 °C (88 °F) although during heat waves, summer highs can cross 35 °C (95 °F). The lowest temperature ever officially recorded for the city was -22 °C (-7 °F), and the highest temperature ever recorded was 40 °C (104 °F). High Point has a humid continental climate, though being located between the mountains and the ocean it experiences less temperature fluctuation than inland areas. The Piedmont Authority for Regional Transportation(PART) also operates in High Point. It is a service that shuttles people in between most of the cities in the northwestern Piedmont region of North Carolina. High Point also provides public transportation. The main service for public transportation in High Point is Hi tran, the local bus service. This building spree culminated in 1927 with the opening of High Point High School. Among the many high styled school complexes in the state, few surpass High Point’s grand 1927 high school. The campus joined the talents of two designers; Greensboro architect Harry Barton and Charlotte landscape architect Earl S. Draper. The building was matched in 1931 with the addition of Ferndale Middle School just to the east, designed to incorporate details from the high school so that it maintained a campus theme. Both shared athletic facilities on a large tract of land between downtown and Emerywood. An additional high school, T. Wingate Andrews High School, was established in the 1960s. High Point succeeded in attracting the college over rivals Greensboro and Burlington with a gift of 60 acres (240,000 m2) and $100,000 in pledges from leading citizens. High Point College opened in 1924 (changed to High Point University in 1991) with three buildings at various stages of development. Many of the numerous civic organizations founded in the 1920s pledged funds, including the Rotary, Kiwanis, Civitan, and the American Business Club. The architectural design of the High Point College campus was in keeping with traditional and historical architectural initiatives found at many private colleges and universities across the state in the 1920s. The administration building (Roberts Hall), male and female dormitories (McCulloch Hall and Women’s Hall, respectively), and a central heating plant were all erected between 1922 and 1924 according to designs by Washington, D.C., architect R. E. Mitchell with assistance by High Point architect Herbert Hunter. Today, High Point University is a four-year, coeducational, liberal arts university related to the United Methodist Church. It offers 50 majors in a traditional day format. It also offers non-traditional Evening Programs, and the Graduate Studies offers four Master's degrees and six programs. High Point is also the home of John Wesley College, as well as one of the nine Shaw University "CAPE" (College of Adult and Professional Education) program centers. Angela Peterson Doll And Miniature Museum - One of the south's largest doll & miniature museums. Bernice Bienenstock Furniture Library - World's largest collection of books on the history of furniture and interior design. High Point City Lake Park - Recreation and amusement park located on the shores of 540-acre (2.2 km2) lake with boating, fishing, paddle boats, picnic areas with shelters, fishing boat and canoe rentals, historic carousel, train, waterslide, largest outdoor swimming pool in the state, miniature golf, gymnasium, playground and excursion boat. Site of annual "Day in the Park" festival each September. High Point Community Theatre - Founded in 1976, High Point Community Theatre (HPCT) presents American musicals, dramas and comedies performed by local actors. HPCT also has an education program, featuring classes, workshops and camps for adults, youth and children. High Point Museum and Historical Park - Museum commemorating the history of High Point, coupled with interpretative exhibit of log Blacksmith Shop and 1786 Haley House. High Point Public Library - A full-service public library contains nearly 400,000 books, music recordings, videotapes, audiobooks, periodicals, newspapers, and a comprehensive collection of books related to history and genealogy. Historic Castle McCulloch Gold Mill - McCulloch Gold Mill was built in 1832 and operated primarily as a gold processing center serving local gold mining operations. Now open as a special events center. Millis Regional Health Education Center - Interactive health education center with features depicting facets of human anatomy and health. Museum of Old Domestic Life - Quaker museum established around 1926 in 1858 Springfield Meeting House, containing a broad selection of artifacts from typical colonial Quaker homesteads. North Carolina Shakespeare Festival - Headquartered in the High Point Theatre, this professional troupe presents classic and contemporary plays during their September through December season. Piedmont Environmental Center - Features 375 acres (1.5 km2) of hiking trails adjacent to High Point City Lake, nature preserve, nature store, small animal exhibits, the North Carolina Mapscape, and access to an eight mile (13 km) Greenway Trail. Rosetta C. Baldwin Museum - The museum was created in November 2000 to honor the legacy of Miss Rosetta C. Baldwin, her family and many African-Americans. The site depicts a typical home of a southern African American family during the mid-twentieth century. Sechrest Gallery - Located on the campus of High Point University in the Hayworth Fine Arts Center, the Sechrest Gallery houses permanent collections of 18th and 19th century British Art coupled with rotating exhibitions. Theatre Art Galleries - Housed in the High Point Theatre since 1975, the Theatre Art Galleries (TAG) hosts exhibitions of contemporary visual art. TAG has been the sole independent nonprofit provider of the visual arts in High Point and includes one of the finest stage and gallery spaces in the Southeast. World's Largest Chest of Drawers - Iconic symbol of the city since 1926, the World's Largest Bureau is an example of automobile-oriented pop architecture and has been featured on numerous broadcasts such as MTV and The Travel Channel. Brentwood Baptist Church (High Point, North Carolina) was built 1964 to the designs of Lawrence Henry Mallard of Lawrence Henry Mallard, 17041 Battleground Ave, Greensboro, North Carolina 27408. Adrian Wilson, safety for the NFL's Arizona Cardinals. Brian Williams, cornerback for the NFL's Jacksonville Jaguars. ^ John Joe Schlichtman, "Making Temp Town: The Political and Economic Machinations of the Furniture Capital of the World.” Small Cities: Urban Experience Beyond the Metropolis, Routledge. 2006. ^ Paul Johnson, "SHOWROOM DEAL: Report raises possibility of mega pact involving High Point, Las Vegas,"High Point Enterprise, February 1, 2011. ^ "College of Adult and Professional Education (CAPE)". Shaw University. http://www.shawu.edu/a_admission_cape.htm. Retrieved 2008-06-02. ^ "Herbert F. Maddalene" American Architects Directory, Third Edition (New York City: R.R. Bowker LLC, 1970), p.590. This page uses content from the English language Wikipedia. The original content was at High Point, North Carolina. The list of authors can be seen in the page history. As with this Familypedia wiki, the content of Wikipedia is available under the Creative Commons License.